Hearty enough to be a vegetarian entree, cauliflower, tomatoes and spices help keep your immune system strong and healthy, deliciously. Cook: If using head of cauliflower, remove green outer leaves and thick tough stem from fresh cauliflower. Add a cup of water to a pot big enough to hold the cauliflower. Heat water to boiling. Add cauliflower. Cover with lid. 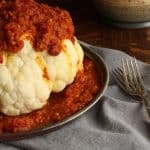 Cook cauliflower until crisp tender, about 10 minutes. Remove from heat, set aside. If using a bag of cauliflower florets, cook according to package directions. Cook this: Meanwhile, heat oil in medium-sized pan over medium heat. Add ginger and garlic; cook, stirring until ginger browns but doesn’t burn, about 3 minutes. Stir in the dry spices, coriander, cumin, turmeric, salt, cayenne and red chile flakes. Stir until fragrant, about 1 minute. Pour in canned tomatoes. Heat through, about 5 minutes. Pour mixture over cauliflower. Serve immediately or a room temperature. Look for cauliflower that is creamy white and a tight, compact head. Avoid those with brown spots. Fresh cauliflower can be stored in the refrigerator for up to 5 days.